While Hard Disk Drives (HDD) remains the leader in the storage media space, new computers and notebooks are increasingly moving towards the more efficient and faster Solid State Drives (SSD). Storage media technology has leaped dramatically over the last two decades and we have remarkably managed to keep up with the increasing use of data in terms of storage technology. Data storage has revolutionized astonishingly since the initial models from the conventional punch cards which could store a mere 960 bits of data to the floppy disks and all the way through CDs and DVDs to HDDs and SSDs. Starting from the very first hard disk drive developed by IBM under the code name RAMAC to the compact and lightweight HDDs with increased capacity to the ultra-portable SSDs, storage technology has transformed dramatically over the years. This article highlights some key differences comparing HDDs and SSDs on various fronts to determine which one’s the best for your individual needs. Hard Disk Drive, or simply referred to as a HDD, is a data storage device that uses magnetic storage for storing and retrieving digital information and data using rapidly rotating disks called platters. 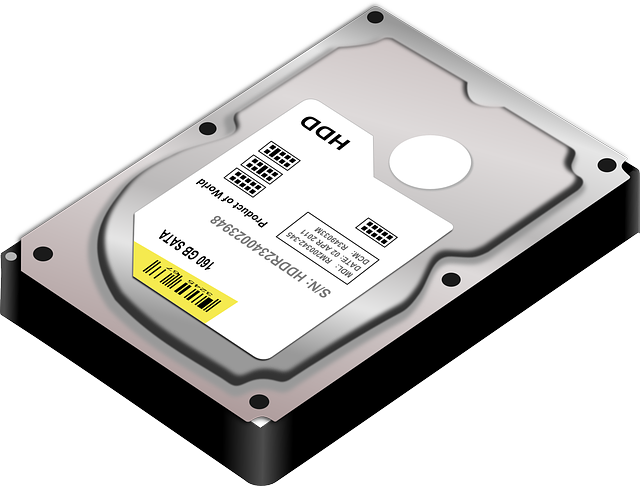 HDDs have been the dominant secondary storage device for general-purpose computers ever since IBM developed the very first HDD in 1956. It still remains the market leader in digital storage solution due to the increasing demand of more storage because of the increasing use of digital data in the modern era. Solid State Drives, or SSDs, are a non-volatile storage device that stores and retrieves data persistently on solid-state flash memory. They are a relatively newer technology that does almost everything a hard drive does, but data is stored on interconnected flash memory chips instead of platters, making them relatively faster than HDDs, up to 30 percent faster in terms of read/write speed which accounts for better performance. They are more like improvised HDDs that use NAND-based flash memory to store data, which is a non-volatile memory that is able to retain data even after the power is lost. Both HDDs and SSDs are storage devices used basically for the same purpose – that is to store your personal documents, files, digital media collections, and applications efficiently for long-term – but as not all technologies are built the same, they have their fair share of distinguishing points as well. HDD, short for hard disk drives, is the most popular and widely used storage solution available to consumers and the technology have been around for decades relative to the technology world. It is capable of storing several terabytes worth of data in a compact storage device. In contrast, SSDs, or solid state drives, are a relatively newer technology that stores data on solid-state flash memory. Hard disk drives are mechanical drives that use magnetic storage to store data on a rotating platter. It consists of revolving disks called platters that are positioned around a spindle, an actuator arm with a read/write head for each platter, and motors to spin the platters which in turn store and retrieve the data, at a speed ranging from 4,200 rotations per minute to 15,000 rpm resulting in a faster performance. Solid state drives, or SSDs, are a non-volatile storage solution that stores data persistently on solid-state flash memory. They are a potential replacement of hard drives with no moving parts involved. HDDs have a relatively slower read/write speed compared to solid state drives because the performance of a HDD relies on the platter – faster the platter spins, faster the HDD performs. The average read speed of an HDD can go up to 128 mbps and the write speed can be anywhere between 50 to 120 mbps. SSDs are relatively faster as there are no moving parts involved with a maximum write speed of 654 mbps and the average read speed can go all the way up to 712 mbps for high-end drives. SSDs are up to 30 percent faster than HDDs in terms of read/write speed. HDDs are available in standard 3.5-inch and 2.5-inch specifications and are able to store several terabytes worth of data. They are high-capacity storage devices that can store up to 10TB of data for desktop computers and 2TB maximum for laptops and notebooks. SSDs are much smaller in size and can hold up to 1TB of data for notebooks and laptops, and up to a maximum of 4TB in desktop computers because of the pricey silicon chips available. HDDs are a whole lot cheaper than SSDs and for same amount of storage, you might have to pay twice as much for an SSD than an HDD. HDDs use magnetic storage to store and retrieve data and more mechanical parts means the device is more prone to failure and data loss in case of accidental falls or mishandling. This is a major concern in notebooks which involve delicate parts which make them more vulnerable to damages and shudders. SSDs are more durable than HDDs as there are no moving or mechanical parts involved, plus the small form factor accounts for mobility. The lifespan of SSDs is far better than HDDs with little or no risk of data loss or integrity failure. Plus SSDs generate less heat than HDDs. Both HDDs and SSDs are the most common storage technologies used to store and retrieve huge amounts of data in compact hand-held storage devices. However, HDDs remain the people’s choice of storage media because of the multiple storage options with the capacity to store terabytes worth of data in a much cheaper price range against the much pricier SSDs. 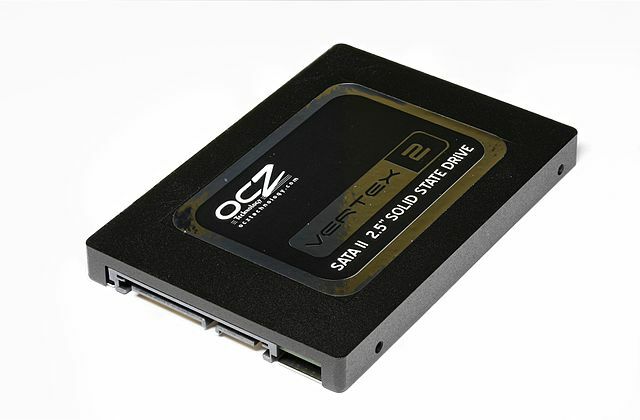 However, with the increasing demand for more speed and better computing performance, more and more tech-savvy people turn to the more efficient and durable SSDs as their preferred storage solution for their systems, especially in laptops. If you’re looking for performance over capacity, durability over cost, then SSDs are a long way to go. Sagar Khillar. "Difference Between HDD and SSD." DifferenceBetween.net. 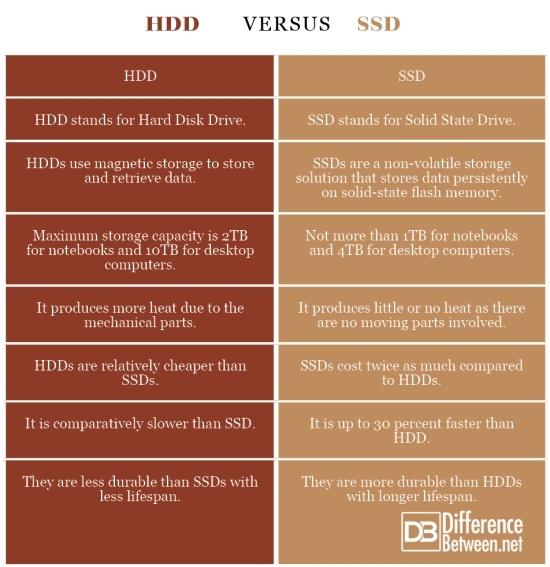 August 9, 2018 < http://www.differencebetween.net/technology/difference-between-hdd-and-ssd/ >.